Degenerative mitral valve disease (DMVD) is the most common cardiologic disorder in canine population. It has been estimated to account for 75% to 80% of canine cardiac disease1. It is common in small breed dogs, but also can be encountered in large breeds like german shepherd and other . The disease characterizes with thickening and enlarging of the mitral leaflets, elongation of chrdae tendineae and mitral regurgitation. Histopathologic features are expansion of extracellular matrix with glycosaminoglycans and proteoglycans; valvular interstitial cell alteration; and attenuation or loss of the collagen-laden fibrosa layer2. Because of the mitral regurgitation the usual course of this disorder represents volume overloud of the left atrium and left ventricle , eccentric hypertrophy of the left ventricle , dilation of the left atrium ,and left sided congestive heart failure . Increased pressure in left atrium and pulmonary veins leads to pulmonary edema . Often complication is so called passive pulmonary hypertension , consequence of increased pressure in pulmonary veins. Really rare complication is left atrial rupture . Richka is 12 years old mixed breed dog with history of DMVD , threated only with enalapril . She was admitted in our clinic for cardiologic examination, because recently increasing in coughing and exercise intolerance. 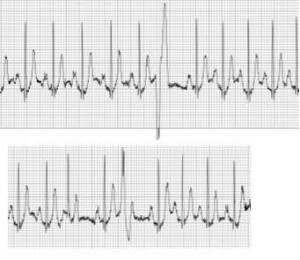 During the examination she was tachypneic , normal mucous membrane color , alert and responsive .She had increased heart rate. Auscultation revealed right and left apex systolic heart murmurs. The abdomen was swollen with palpable fluid thrill. We have made echocardiographic examination, with the patient on left and right lateral recumbency, with all parasternal views according to the accepted standards. We found eccentric hypertrophy of the left and right ventricles, left and right atrial dilation, thickening and prolapse of the mitral valve. 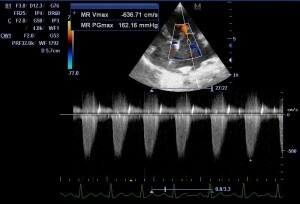 Doppler examination shows mitral and tricuspid regurgitation with pressure gradient of 162 mmHg and 62 mmHg respectively (figures 1,2,3) . Abdominal echography revealed ascites. So we diagnosed degenerative mitral valve disease with secondary pulmonary hypertension. We prescribed following: pimobendan – 0.25 mg/kg/bid , furozemid – 4.0 mg/kg/bid , spironolactone – 1.0 mg/kg bid enalapril – 0.5 mg/kg/bid , sildenafil – 1.0 mg/kg/tid. Week later on control examination Richka was better, ascites resolved , mitral and tricuspid regurgitation was with gradient 125 mmHg and 43 mmHg respectively. So we decreased the dose of furosemide to 2.0 mg/kg/bid, and the other drugs were continued with the same doses. Several months later the owners noticed again swelling of the abdomen and the dog collapsed after exercise. 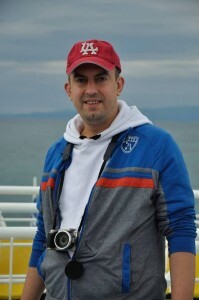 When they came in the clinic Richka was tachypneic with cyanotic mucous membrane. On auscultation we have found 5/6 systolic murmur on the right haemithorax with palpable precordial thrill. 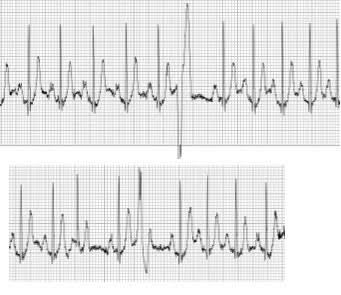 Electrocardiography revealed sinus tachycardia – 156 bpm , with premature supraventricular and multifocal ventricular complexes (fig 4). We have made roentgenography in right lateral (fig 5) and dorsoventral (fig 6) position. There was generalized cardiomegaly with dilation of the pulmonary vessels. On echocardiographic examination we have found eccentric hypertrophy of the left and right ventricles, paradoxical motion of the ventricular septum (fig 7), mitral and tricuspid regurgitation with gradient – 118 mmHg and 42 mmHg respectively. 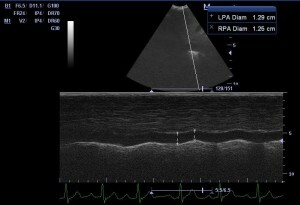 Abdominal ultrasonography showed ascites with no collapse of the caudal vena cava with respiration (fig 8). 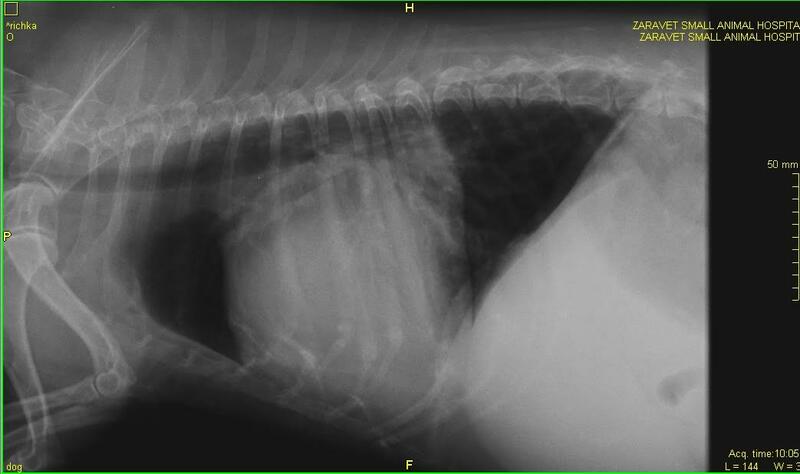 Despite the medications and lower then before pulmonary pressure in this dog the signs of right heart failure were predominant. Because of that and the palpable precordial thrill on the right side we suggested right to left intracardiac shunt. 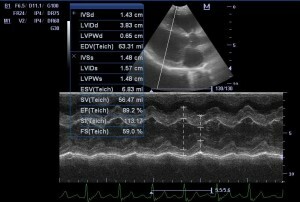 The presence of ventricular septal rupture is less possible, so we decide to search for rupture of the atrial septum. On the right parasternal 4 chambers view modified for better visualization of the right and left atrium with atrial septum, we have found rupture of the septum in the region of the fossa ovalis with left to right shunt. 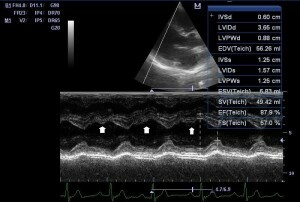 Video 1 and 2 are same loops with and without colour Doppler demonstrating the defect and shunt of the blood. In this region very often because of the echo dropout on 2d image can be seen a hole in the atrial septum. To be sure that this is a real defect we decided to make a bubble contrast study. We injected 10 ml of agitated saline in v.cephalica antebrachii thru i.v. catheter. When there is right to left shunt the microbubbles are seen in left atrim, left ventricle or arterial circulation – usually the abdominal aorta. But in left to right shunt the goal of the bubble study is to notice contrast washout during right atrium passing of the bubbles. Video 3 and 4 show right parasternal short axis view of the base of the heart with cranial vena cava. We can see the entrance of the contrast and the following washout like a flame because of the left to right shunting of the blood. In this situation sildenafil makes the pulmonary pressure lower and facilitate the shunt from high pressure left atrium to low pressure right atrium. So we decided to use pulmonary hypertension properly and make the dose of sildenafil lower – 1 mg/kg/24 h. with presumption that higher right ventricle and right atrium pressure will make the amount of the shunt lower. 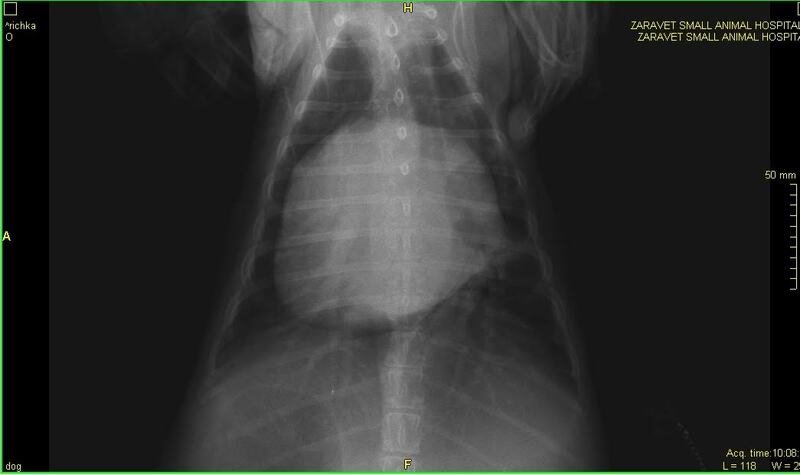 72 hours after this change the ascites resolves and the condition of the dog became better. On the time of the written of the article Richka is about half year on this medications with sildenafil once per day and no changes in other medications and the only clinical sign is exercise intolerance. 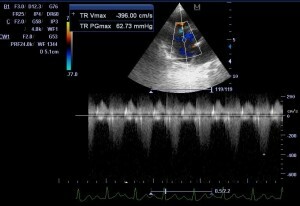 Rupture of the atrial septum is really rare complication of mitral valve disease. Most commonly the rupture occurs in caudal weaker part of atrial wall. In a study of Buchanan JW from 30 dogs only in 4 was found rupture of the interatrial septum with signs of right heart failure3. In another study from the same investigator from 50 dogs 7 have acquired ASD4. 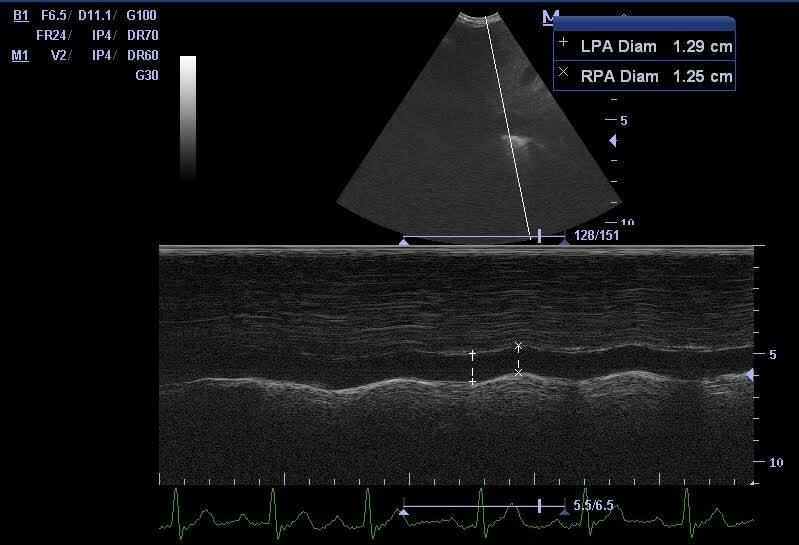 The еtiology for rupture of the left atrium is uncleаr , but probably is related with the high pressure in the left and right atrium and the so called jet lesions from the mitral and tricuspid regurgitation. Usually the mitral regurgitation jet is toward lateral wall of the left atrium like in this case (video 5). Tricuspid regurgitation jet was directed to interatrial septum so probably contributed to rupture of the septum. The thin fossa ovalis is weak and suitable place for this kind of lesions. In human medicin rupture of the septum is reported after blunt chest trauma , most often accompanied with rupture of the tricuspid valves 5,6. The proposed reason is that compressivе force occurred during isovolumic contractiоn with maximally dilated ventricles and closed atrioventricular valves5. In humans right ventriсle is right behind the sternum , and this predispоse it to injury. In those cаses when there is rupture of the tricuspid valve and massive regurgitation , the increased pressure in right atrium leads to rupture of the septum and right to left shunt. 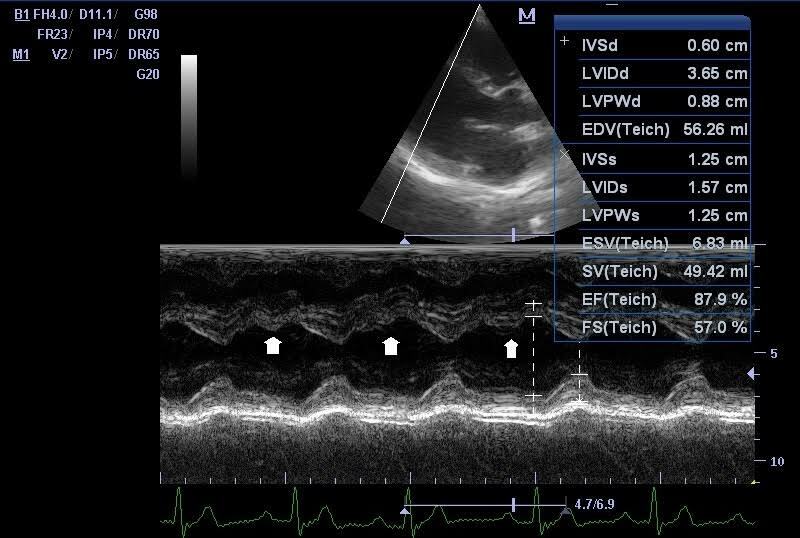 In canine patients with degenerative mitral valve disease after the rupture of caudal atrial wall and following haemopericardium the clinical signs are collapse and sudden death. After rupture of the atrial septum the predominant signs are of right heart failure. In this case the right atrium and ventricle serves as a low pressure “sink” for severely dilated left atrium. 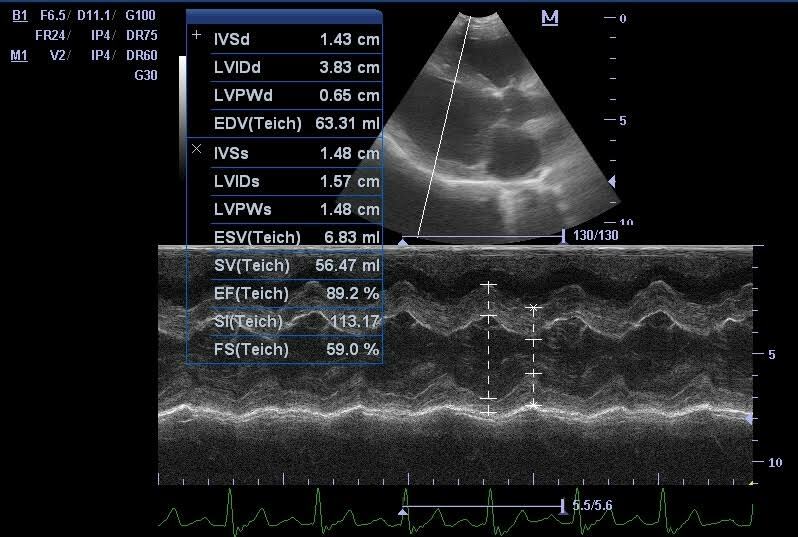 There are several publications about echocardiographic diagnosis of acquired atrial septal defect and rupture of the atrial septum with haemopericardium3,4. 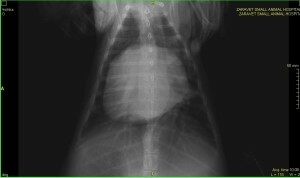 The bubble contrast study has been validated in veterinary echocardiography for diagnosis of congenital and acquired intra and extra cardiac defect and shunt7,8. In this case we have demonstrated the usefulness of so called contras washout – result of bubbles free blood entering contrast rich compartment. 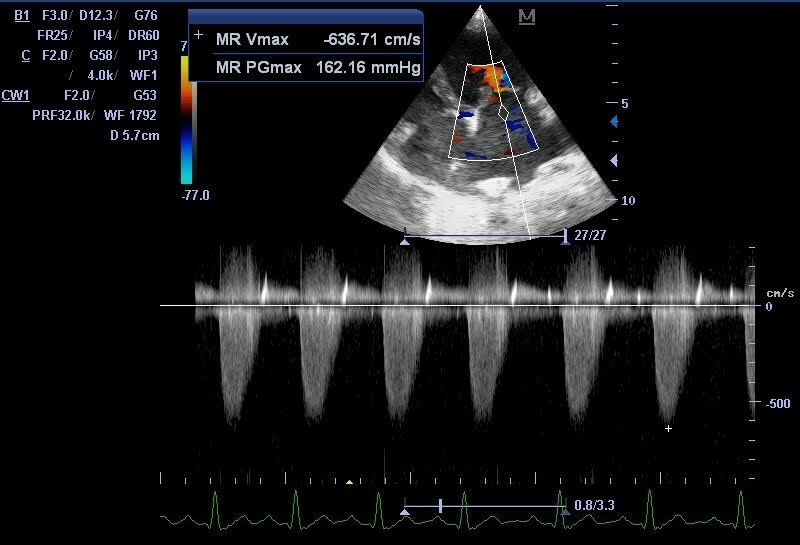 In conclusion in any dog with degenerative mitral valve disease and predominated signs of right heart failure we have to look echocardiographically for atrial septal rupture. More we scan , more we find , and more we learn.